Freelance content writing jobs are in great demand, especially among people who plan to work from home. From working professionals looking for part-time jobs to homemakers, freelance writing is for everyone, and all that’s required is good command over the language and writing skills. There are a number of content writing companies that offer freelance content writing jobs. These companies have different procedures for hiring, but their requirements are the same – they all look for the perfect candidate who is dedicated, responsible, and easy to work with. Take it from us – companies love working with professional freelancers, and to appear as one, there are certain ground rules you should observe while applying for a position. Here are some tips that will help your application stand out from the rest. It is important to send a mail with an appropriate subject line. The subject line is usually mentioned in the job description itself or a job reference number (in that case, use that as the subject line). In case it’s not been mentioned, use a simple subject line like ‘Application For The Post of Freelance Writer’ or ‘Application For Freelance Content Writing’. 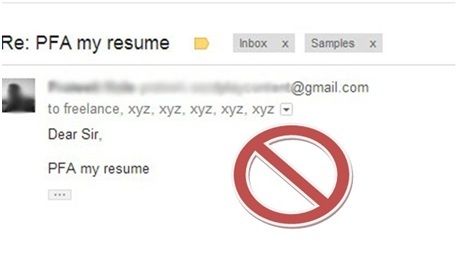 We receive hundreds of applications a day, so when we see mails with non-descriptive subject lines like ‘Resume Attached’ or ‘Application for Job’, we naturally sense the applicant’s lack of interest. The more vague your subject line is, the greater are the chances of your application being unnoticed. Need freelance content writing jobs? Avoid blank mails. Sending a single mail to multiple companies, with their email IDs added one after the other in the address box, is a common mistake that writers make. By doing this, you’ll come across as sloppy and unprofessional. It is important to send a unique mail to the content writing company you’re applying to. This might take a little more time, but you’ll gain brownie points for taking the effort. Check the company’s work culture and apply accordingly. Check out the company’s website and Facebook/Twitter pages to get a better idea – you don’t want to send a stiff and formal mail to a creative company and vice versa. Can you see what our Facebook page says about us? Check us out! When you’re applying for freelance content writing jobs, mention a line or two about the position you’re applying for and about the relevant experience (if any) you have. Add a few lines about yourself so that they know that you’re really interested. At Wordplay, we receive hundreds of applications on a daily basis, and mails that feature cover letters are the first to catch our eye. Also, mention why you like writing and what attracts you towards a freelance writing career. 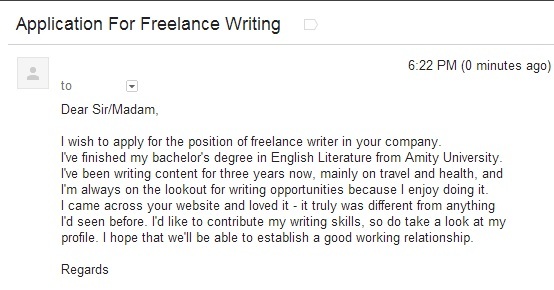 Make sure that is interesting to read, and proofread the cover letter to remove grammar errors and typos. This will help you break the ice and showcase your passion. Never lie while writing a cover letter. Be honest about your interests and abilities so that you land the right job. Mails with abrupt text like ‘Please find my resume attached’ or the clichéd ‘I’m submitting my resume for your kind perusal’ are also likely to be ignored. With cover letters, freelance content writing jobs are easier to get. It is always a good idea to attach a sample of your work while applying for freelance content writing jobs. This will make it easier for the company to assess your writing skill. Write an original sample and write in with your natural flow. Remember, as a content writer you’ll have a daily or weekly workload, and your quality levels should be consistent. At Wordplay, we don’t expect a stellar sample that took you days to write, because it’ll be hard for you to stick to the standard on a daily basis. We expect a normal sample that helps us gauge your writing skill, and this way you can also ensure that your work load isn’t too taxing. Once you have mailed in your sample article and cover letter, companies might take around one/two/three weeks to get back to you. We contact our applicants over a two-week time frame, but in some instances, we’ve noted that writers get agitated and anxious quite soon when we don’t respond. Do not mail companies or call them incessantly just 24 hours after applying, demanding a response. It’s a good idea to wait for five days, after which you can send them a follow up mail requesting an update. Desperation is never a good thing, especially when you apply for a job. If your application has been rejected, take the rejection gracefully. Being rejected just means that your requirements don’t fit with the company’s, so just move on and apply for another job. Do not lash out or send replies like ‘another company accepted the same sample’ or ‘I don’t think there’s anything wrong with my work’. Instead, ask them the reason for your rejection and enquire whether you can re-apply or not. Also, try to work on the highlighted issues before re-applying. As a professional, you should be diplomatic and open to criticism for you to grow further in any field, so keep this in mind. Once you follow these tips, your application is sure to stand out from the rest and you’ll find it easy to successfully get freelance content writing jobs.